Bruno Mars can do it all. He can sing, dance, and steal the show with his presence. Musically, his tracks are incredibly diverse containing ballads like “When I Was Your Man”, pop hits like “Treasure”, and funky throwbacks like “Uptown Funk”. Off his debut studio album, Doo Wops & Hooligans, “The Lazy Song” somehow manages to be completely different from anything else in Mars’ catalog, and that is the mark of a truly great artist. Bruno Mars is the man in the flan doing his dance. Music typically aims to be inspirational in a way to make us want to achieve more. This song is the exception to that ideal. This song is an expertly crafted anthem to laziness, starting off with a chorus that is as catchy as it is relatable. Honestly, who hasn’t had a day where you just didn’t want to do anything except stay in bed. The music borrows heavily from reggae music, and has a general calming feel to it. The lyrics describe the best day possible of doing absolutely nothing, and Bruno doesn’t make you hate him for being aloof. 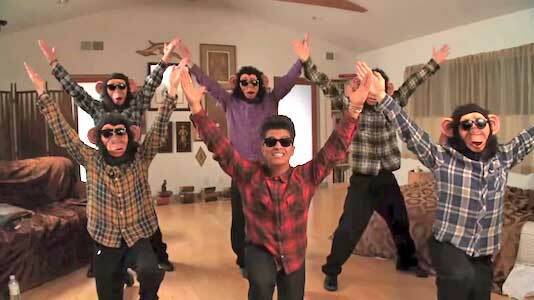 The music video features Bruno and his ape friends doing a one take, synchronized dance in his house, wearing coordinating flannels, Ray Bans, and all-black chucks. The video, much like the song, is endearing, fun, and makes laziness seem like the life to live. As stated, the chimps and Bruno all wear black chucks while they dance, eventually ending up in their boxers while confetti sprays all over the place and Bruno plucks the guitar. 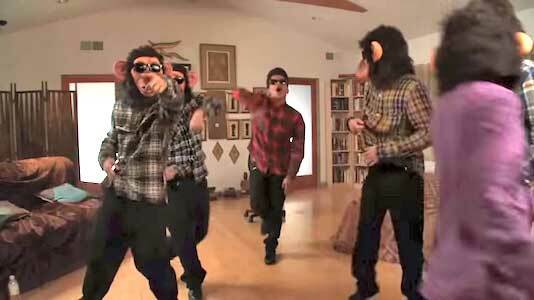 This might be the greatest music video ever. It has laziness, dancing chimps, and confetti! What’s not to love? 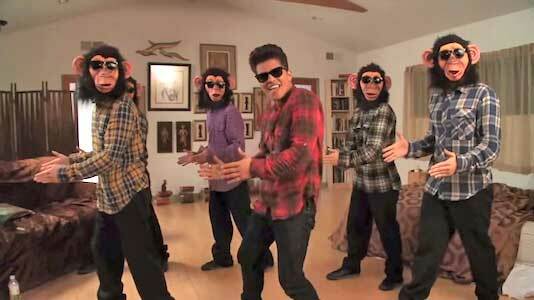 Just Bruno and some chimps poppin ‘n’ lockin. Get yourself a pair of chucks to kick back in by clicking on the links below.